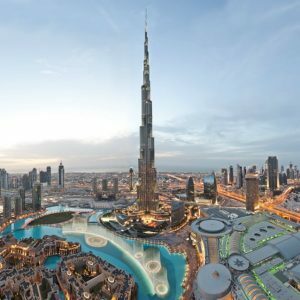 There are many ways to do a scavenger hunt in dazzling Dubai. The hunt described below is by car, so you can span the city, making discoveries. We also have an unadvertised hunt that makes use of the Dubai subway. And these are just our pre-scouted hunts. How about a shopping mall hunt. Or a hunt at the Dubai Parks and Resorts theme park. Just tell us what you want and where you want it, and we’ll happily create it for you! Okay, here’s some info on our driving hunt in Dubai. Event Description: A location like no other for a corporate teambuilding event, Dubai — the most populous emirate of the United Arab Emirates — is a booming place, said to be currently employing up to 20% of the world’s construction cranes. Traditionally a center for oil production, of course, Dubai is also developing as a hub for service industries such as IT and finance. What attracts the visitor, first and foremost, is the stunning 21st century architecture: the Emirate Towers (12th and 24th tallest buildings in the world), the iconic Burj al-Arab hotel, located on its very own island in the Persian Gulf; Jebel Ali, the largest man-made harbour; and the Mall of Emirates, one of the largest malls in the world. In many ways, a visit to Dubai is like dropping in on the Jetsons. During your corporate teambuilding treasure hunt (by car or taxi) in Dubai…expect to visit an English pub, an Irish pub, a tennis stadium cafe, and an establishment that looks like an Egyptian pyramid.